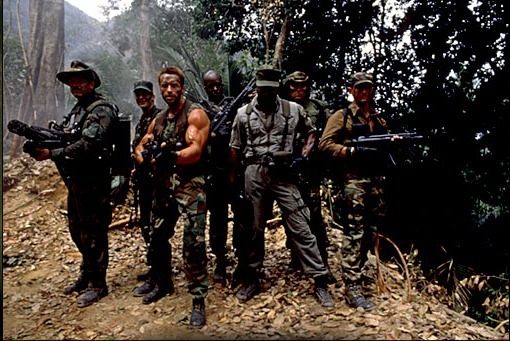 PREDATOR is a sci-fi/horror/action flick about a team of mercs led by Arnold Schwarzenegger going into a jungle country to rescue a high-value target. Soon, the hunters become the hunted. I watched PREDATOR (1987) on Blu Ray 6.7.09. It was, as far as I can remember, my third viewing of the film. I don’t think I’d seen it since middle school though. Part of this score is always based on thematic elements. I often like to see that movies have something to say about the world it comes from, or the audience watching it. Well, sometimes a movie has a lot to say, it just doesn’t say it very well. PREDATOR is an example of that. I know it seems a bit off-point to discuss the filmic values of a movie obviously made for the fun of action. However, the themes are so completely apparent in this movie that they need to be mentioned. First is the concept of hunting. Celebrated by many humans, the sport of hunting is the title character’s driving force. He hunts only those with weapons, and leaves the helpless alone. So when he comes across this team of trained mercs, he begins his hunt. The underlying tone here is to mark the ‘hunter’ as ‘alien’ and ‘unfeeling’, while also comparing him to humans who do the same. It does this decently well, by promoting mindless killing of faceless (though armed) foreigners by the Americans earlier in the film. It could be argued that the senseless assault is the impetuous for their punishment, except it is not apparent whether or not the Predator sees this. He, instead, seems more motivated to kill when he discovers that the humans have killed a poor innocent scorpion. Of course, this ignores the fact that a scorpion is potentially deadly given its own ‘biological weapon’. Furthermore, this appears to be the point when the Predator decides to kill all these guys. If it is all about sport (as is later revealed) what is with the scorpion? Does it make it personal for the Predator at that point? Ultimately, we have unclear motivation. This is one of those 80s movies which regards women as prop pieces. An enemy woman is captured by the group during the assault. They bond her and drag her around with them (though we are led to believe that Schwarzenegger has a good heart, he lets this happen anyway). She tries to get away a couple times, but her role is really to put some question as to how ‘good’ these mercs are. It allows us to almost celebrate some of their deaths. It is an interesting way to put this team of guys on opposite sides, and of varying levels, of good and bad. However, the good and bad are equally punished, so we don’t really get a big boost from that. For a movie which seems to be critical of the concept of hunting, it sure glorifies the actual moment of the kill. So all this seems to have a conscious thematic thrust, which could be explained succinctly by a poignant ending. It’s actually a descent script structure for a multi-genre 80s flick. The problem is that it is any semblance of completing a thematic thought is thrown away at the end. This is a movie which would benefit from an unhappy and destructive ending. So much effort has been put towards showing that the major difference between the Predator and his human counterparts is his technology. But rather than embrace that concept and make the end an equal-punishment scenario, we have to make Schwarzenegger the hero by suddenly painting the Predator as a consciously ‘bad guy’ when he turns on his self destruct and mimics human laughter as he blows himself up, trying to take Arnold with him. It’s the first time the Predator shows ‘human’ emotion, rather than just mimicking what they do. Previously he had mimicked their sounds to distract them during his hunt. Here he seems to understand what the laughter is intended for, and uses it to evoke a human emotion. It rings as false when compared to the set up of the first hour and forty. But enough of that crap. This movie is fun. Purely as entertainment, it makes you laugh and squirm and the audience is of course rooting for Schwarzenegger to win. My favorite gratuitous moment in this film is when Arnie first sees his old friend played by Carl Weathers. They see each other and say hello by giving each other one of those arm clasp high fives. The camera cuts to a shot of their arms, showing Arnie’s massive biceps. I think his biceps were given their own contract. The dialogue is cheesy as hell. Arnie throws out his one liners without regard for human safety. Jessie Ventura gets one of the great shameless masculine lines when he says “I ain’t got time to bleed!” It’s all just completely hammy and campy and fun. It’s not good, but it’s fun enough. But like I alluded to above, the structure of the script is solid in the way it morphs from an action movie, to a hunter/prey horror movie (with a format in this section not unlike Halloween), while all the while infusing the sci-fi elements. I would score this a tick higher, but I have to put a lot of those thematic confusions on the script as well. I do wonder if there was an earlier version with a bit of an unhappier conclusion. SCORE: 5. FINAL SCORE: 5 (though the most important score is the MOVIE one). Interesting side note… I think the films I’ve written the most about so far are ROBOCOP and PREDATOR… what is wrong with me? ~ by johnlink00 on June 10, 2009.